During the the 1980's I was an overweight child who consumed too many Oreo's and ice cream sandwiches. Approaching adolescents in the middle part of the decade I was far from being popular with the girls. Short, dark and stocky is very different from tall, dark and handsome. As puberty drew nearer, the girls withdrew further. So as a subconscious aversion I became addicted to Cardinal baseball. Spending my time studying box scores as my boyhood peers began studying the anatomy of suddenly developing young girls. It was the summer of 1985 that my obsession became apparent. While other boys my age were producing mix-tapes of love songs for cute little crushes, I was doing the same. But my cassettes were filled with a collage of Cardinal commercials set to the theme song "The Heat is On," a Glen Fry special that became the Redbirds anthem for that unforgettable season. I would sit alone in my bedroom, which was a shrine to my beloved baseball team, with a duel cassette boom box, a bag of chips and an odd abundance of patience. When the commercial finally would air I would immediately press record and listen triumphantly while goosebumps covered my skin. The music was accompanied with Cardinal soundbites and radio clips of recent broadcasts delivered with excitement by the late Jack Buck and the still irreplaceable Mike Shannon. Sometimes even the entire "Heat is On" song would play with a plethora of season defining moments. My favorite being a Jack Buck description of a home run. "Here's the pitch. Swing and a looong one to right field! Adios! And the Cardinals lead, 4-3, on a looong blast by WILLIE MCGEE!" Even to this very moment, if I allow myself too, I can feel tears welling up because it takes me back to a simpler time. A more innocent era, where all that seemed to have mattered was whether I could play wiffle ball outside and who won the Cardinal game that night. Major League Baseball was more intimate then. There were not as many teams, Interleague play was absent, wild card teams did not exist and there were only two divisions per league. The American League and National League were home to only the Eastern Division and Western Division. The winner of each would then face one another in a 7 game League Championship Series. So with only 4 teams competing in October it meant much more to both the teams and the fans. Today 8 teams muddy the waters of Autumn diluting the importance of the regular season and making Pennant races less relevant. The Cardinal teams of the 80's had two memorable division races with the hated New York Mets and a league rivalry with Giants of San Francisco. The Mets were despised so very much that the relatively polite town of St. Louis branded the Big Apple club Pond Scum and tortured the Bay areas power hitting, one flap down, Jeffery Leonard anytime he came to the plate for referring to baseball's Mecca as a "cow town." I can still here the old Stadium erupt into obnoxious chants of JEFF...ERY and DAR...YL anytime these two antagonist had the audacity to step on the hollowed ground of Busch. Throughout those dog days of '85 and '87 fans monitored scoreboards and the standings almost as much as the games themselves. The intensity of those late summer classics against the Mets were as rivoting as any playoff game. When Strawberry and company came to town it was special. The fans knew it and the players felt it. I am not certain that that passion can be paralleled by today's teams or fans, but I am convinced that after last night St. Louis has its new version of Pond Scum. With Brandon Phillips playing villain and the Cincinatti Reds as the enemy of the state. As a town that both truly understands baseball and loves it even more, this city and its fans should envelope this new found hatred for the river city Reds with great enthusiasm. Having plenty of history and underlying story lines between Dusty Baker and Tony LaRussa, LaRussa vs. Scott Rolen this has the makings of an instant classic race to the finish. After last nights stadium cage match. 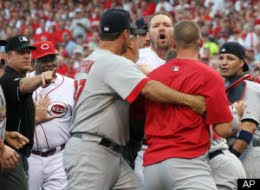 with Johnny Cueto, the dirty Reds pitcher doing his best impersonation of a coked up mule and Brandon Phillips throwing verbal hay makers like Mike Tyson does punches. St. Louis is in store for a treat. The hometown team may have underachieved thus far, but that may have been a baseball blessing. I believe Mr. Phillips woke a sleeping giant and his mouth wrote a check that Cincy's butts can't cash. And now it is time to sit back and witness two teams that share hard feelings and bad blood. Cardinal fans, whether they realize it or not, have sorely been missing a heated pennant race. Because the birds on the bat have dominated this division since 2000 and the 3 million strong have forgotten what it is like to scoreboard watch religiously and sincerely dislike a team not from Chicago. So as you flip on your televisions or walk through those turn styles remember that America's pastime is a marathon and not a sprint and it is better to be a seasoned, well conditioned Kenyan than Usain Bolt. Because the real season has just begun and playing meaningful late September contests usually brings out the best in a true contender. Allow yourself to enjoy the excitement and embrace this race. Oh yeah, start practicing your BRAN...DON, BRAN...DON chants now because the Reds will be in town September 3rd, 4th and 5th! Now excuse me, I have to go burn "The Heat is On" to a C.D. What great memories of those awesome Cardinal teams of the 80s you brought back to me with your post. I'll never forget those seasons or those rivalries. I agree that we should embrace the new rivalry with the Reds. It pumps the players and the fans up and we should ride it right throught a World Series championship this year! Great post dude!